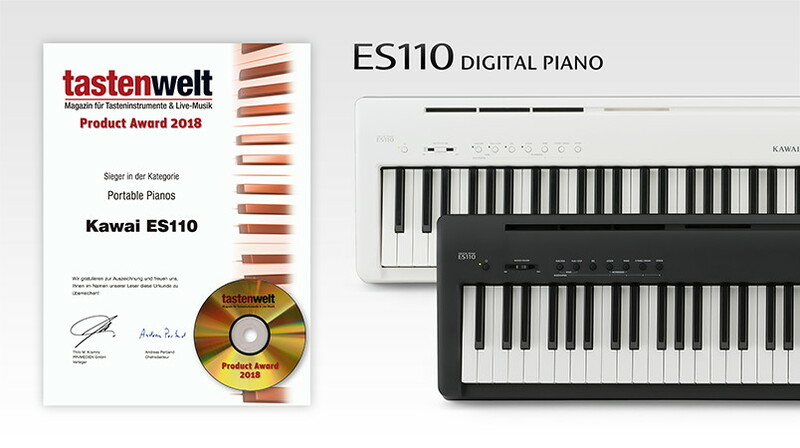 The Kawai ES110 has received a product award from popular German keyboard magazine Tastenwelt, after winning the ‘Portable Piano’ category. Each year the magazine invites its readers to vote for their favourite products in a range of categories, with the most popular models receiving a prestigious Tastenwelt Product Award. This is the second year running that a Kawai ES model has won the ‘Portable Piano’ category, with the high specification ES8 also being selected by the magazine’s readers in 2017. The ES110 was introduced in early 2017 and combines Kawai’s Responsive Hammer Compact keyboard action and Harmonic Imaging piano sound technology, delivering an authentic grand piano playing experience within an extremely compact and portable form-factor. The ES110 incorporates Bluetooth® MIDI, allowing the instrument to communicate with smart devices wirelessly, while its dedicated Line Out jacks make the ES110 an excellent choice for players seeking a lightweight gigging piano. This year’s Tastenwelt award is the 7th that Kawai has received from the German publication, with notable wins for the ES7 in 2015, the CN34 home digital piano in 2014, and MP8 and MP9500 stage pianos in 2007 and 2004 respectively. As one of the most celebrated musical instrument companies in the industry, Kawai has received over 50 major international awards for its product and service excellence, from magazines and trade organisations throughout Europe, North America, and Asia. Tastenwelt magazine is one of Germany’s leading trade publications in the field of keyboards and digital pianos. Established in 1994, the bimonthly magazine provides in-depth product reviews, buying advice, and playing tutorials. Kawai is a global corporation with distribution in virtually every major market in the world. From its beginnings in 1927 in Hamamatsu, Japan, the company has been committed to an ongoing quest to perfect the art of the piano. One of the world’s largest music instrument manufacturers, Kawai celebrated its 90th anniversary in 2017 and is one of the few piano companies in the world still led by members of its founding family.